Before MP3s, CDs, and cassette tapes, even before LPs or 45s, the world listened to music on 78rpm records—those fragile, 10-inch shellac discs. While vinyl records have enjoyed a renaissance in recent years, good 78s are exponentially harder to come by and play. A recent eBay auction for the only known copy of a particular record topped out at $37,100. 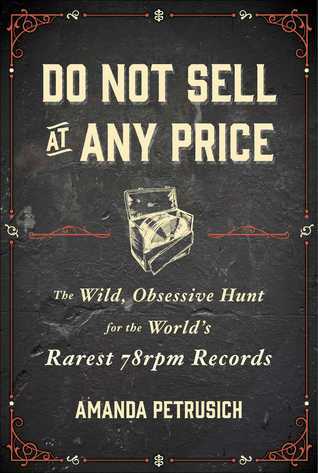 Do Not Sell at Any Price explores the rarified world of the 78rpm record—from the format’s heyday to its near extinction—and how collectors and archivists are working frantically to preserve the music before it’s lost forever. Through fascinating historical research and beguiling visits with the most prominent 78 preservers, Amanda Petrusich offers both a singular glimpse of the world of 78 collecting and the lost backwoods blues artists whose 78s from the 1920s and 1930s have yet to be found or heard by modern ears. We follow the author’s descent into the oddball fraternity of collectors—including adventures with Joe Bussard, Chris King, John Tefteller, Pete Whelan, and more—who create and follow their own rules, vocabulary, and economics and explore the elemental genres of blues, folk, jazz, and gospel that gave seed to the rock, pop, country, and hip-hop we hear today. From Thomas Edison to Jack White, Do Not Sell at Any Price is an untold, intriguing story of preservation, loss, obsession, art, and the evolution of the recording formats that have changed the ways we listen to (and create) music.